Camp/Ambush Pieces - sprayed with matt varnish; tufted; flocked. Finished! Dark Ages Buildings - "thatch" coated with 50% PVA. It works quite well at making the fur simulate thatch. the buildings are almost finished - I just need to add the detailing (doors, windows etc). Late Saxon/High Medieval Hovel (28S-DAR-102). 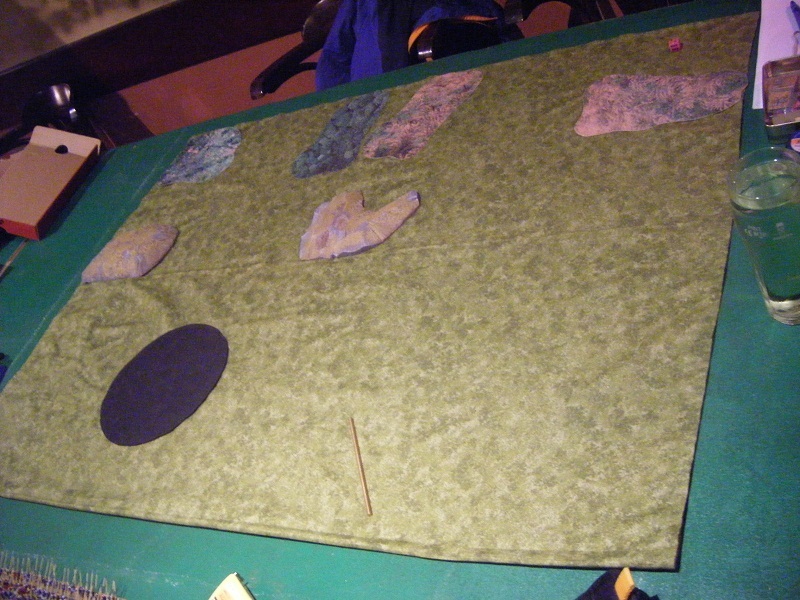 The paler patch is where the glue hasn't completely dried yet. Croats - riders glued to horses; primed with gesso. Next onto the bench will be the 24 cuirassiers, as they'll be a pretty quick bunch to finish. After that I'll do the artillery, then the foot and then the Croats. Once they are done, I think it's time to take a break from historicals and paint up some of the huge 15mm SF pile of got waiting. OK folks, a report of my first game in the club's ECW FoG:R tournament. 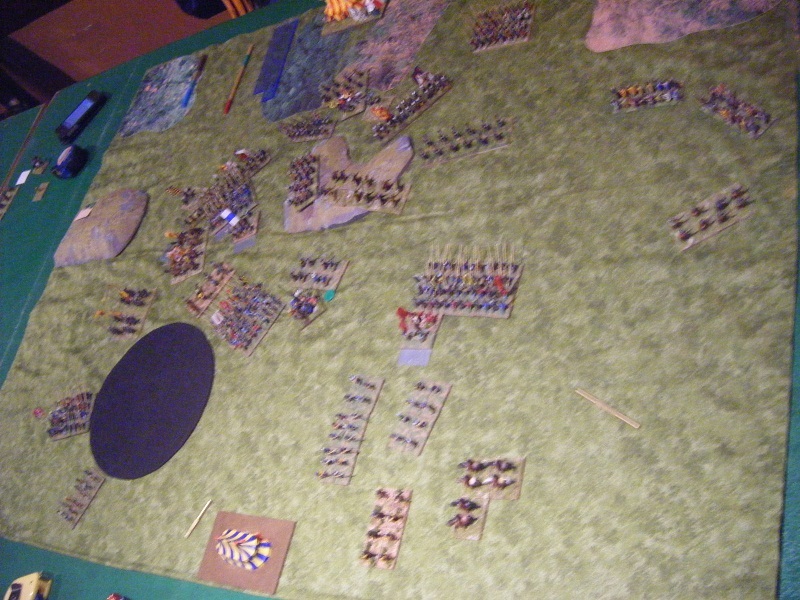 On Thursday my 1646 New Model army were matched up against Gordon's 1650 Scots Covenanters. I'd modified my list since Monday's practice game to increase the number of units I was fielding (albeit with a reduction in the overall quality). 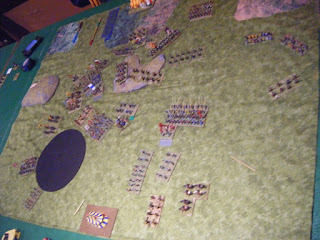 Facing me Gordon had 2 bases of light artillery, four of heavy artillery (as 2 BGs), 2 BGs of lancers and 8 units of foot. Having looked at the deployment and Gordon having done minimal movement told me that he was just going to sit back and play a defensive game. At first the battle was going pretty badly for me - one of the superior horse units and the average one got broken by shooting over on my left wing. However, things started to go a bit better for me after that and I had some brilliant results later on and the outcome was looking very close. In what turned out to be the final turn of the game there was a chance that we could have simultaneously routed each other. Unfortunately the dice were fickle for me and I didn't quite manage to break Gordon's army whilst one of my foot units failed it's cohesion test from shooting hits and dropped to fragmented which was enough to break me. My deployment was somewhat better than on Monday but I really do need to work on how I bring my forces to bear as they were attacking in a somewhat piecemeal manner which allowed Gordon to get several of his battle groups shooting at isolated ones of mine. Positions at the end of Turn 2. the long wooden sticks are "linear obstacles" (walls, hedges) - not in the most useful positions. the blank MDF square in the bottom left field is an ambush marker for my dragoons. I probably should have brought them out at the start of the battle so that I could actually get them doing something useful. Gordon measures the range and arc from his light artillery to my superior foot. Just out! My right wing determined horse advance towards his lancers. At the bottom of the picture you can see one of my average foot units has lost a base from the heavy artillery. A wider view - a unit of foot has gone into column to move past the artillery - they could have moved through the guns, but by doing so would have blocked them from shooting for a couple of turns. The red superior determined horse aren't liking being shot at - 1 base down and disrupted. My superior foot are finally in arc and range of Gordon's light artillery. They didn't like being shot at either. My red horse have charged in and succeeded in losing another base - I was having crappy dice for death rolls at this point in the game. The blue horse charge uphill into the lancers. The impact and first melee were both draws. The column failed it's CMT to expand and so just moved forward. My poor foot have taken up residence behind the linear obstacle. I forgot to take photos for a couple of turns. By this time my red horse had broken, as had the green "average" determined horse, leaving my superior foot slightly isolated. They'd lost a base to shooting, but I decided the best thing to do was to charge them in. As you can see, they did a pretty good job of tearing a hole in Gordon's centre and of disturbing his surrounding units. I think this pic was taken before the pursuit - the unit ahead of them is fragmented and failed its test to stand, so broke and ran. This then dropped the light guns to fragmented. Back to the cavalry fight on my left wing. 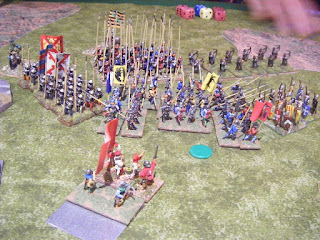 In the previous melee phase I'd disrupted the lancers in front. Gordon's 2nd lot did a flank charge (which disrupted me) but lost at impact. Then in the melee phase I won both fights, dropping the lancers ahead to fragmented and the flank-charging lancers to disrupted. Looking good! Foot and light guns? What foot and light guns? the foot broke and ran, disrupting the foot behind them. The light guns took several hits from shooting and broke as well. Lancers? What lancers? 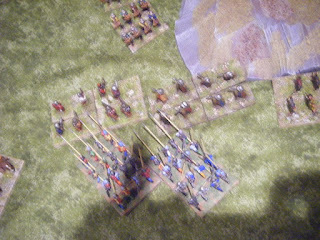 The lancers in front have broken and I've now dropped the flank-chargers to fragmented. So, these average lancers, fighting uphill against superior determined horse have lost a base, are fragmented and I can still expand into overlap onto both flanks? I think this looks pretty good. My dragoons have finally stopped hiding in an enclosed field and moved forward to, errmm, hide in another enclosed field. The blue horse try to come around Gordon's rear for a target-rich environment. Unfortunately my superior foot have lost another base to shooting and been disrupted again. Remember the foot in column that failed its CMT to expand? It did that a couple more times before I realised that I could simply turn 90 and then advance (with a general attached for the 2nd move). If I'd thought about it earlier they could have been more use. Here you see them advancing to my left wing to provide support to the average foot who were originally supporting the superior foot but have become somewhat left behind and isolated. the blue horse couldn't quite get into charge range at the rear, so have come back over the hill to taunt the heavy artillery. One more turn and they should be able to capture one of them which might be enough for a win. Unfortunately my superior foot got broken by shooting and the threat of a charge and can be seen routing towards my baseline in the bottom right. The column unit didn't quite make it in time to support the other foot unit on my left which broke in the previous turn. Here you see the shooting phase of what became the final turn. My foot and Gordon's foot have simultaneously fragmented each other. This was the last point Gordon needed to take to rout me - I need to take 2 more to rout him. So I'd done something either brave or foolish - charged his guns with my firelocks. As they were protected by his foot we ad to fight for them - both the impact and melee ended up as draws. Damn! If the foot on my left hadn't fragmented I might have been able to rout Gordon in the melee phase. My unit of the match. They've only received a brief mention up until now, but these are the Poor foot. Why are they the unit of the match? Well, Gordon's heavy guns seemed to focus all their fire on them in the last few turns, every time forcing a death roll (and a number of cohesion tests). They passed every one. 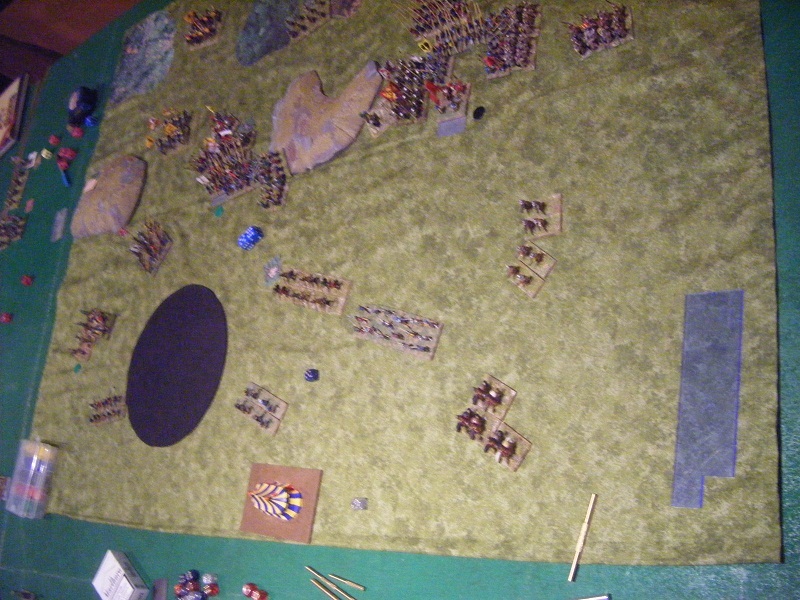 Massed my foot on my left flank and advanced so that several battle groups would simultaneously engage his outermost units whilst receiving rear support from other units. Massed my cavalry on the right wing and advanced rapidly to take the lancers and get into his rear. Brought forward my firelocks earlier in support of the cavalry attack. It was a useful game and at least I now have a better idea of how to handle the army. Hopefully I'll remember these lessons for my next 2 games. I haven't done any painting since Wednesday - I'll start work on the artillery first. The Croats' horses have been glued into painting sticks - I'll glue the riders on tomorrow and might also be able to get them primed. The camp/ambush markers are still waiting for their matt spray - I hope to do that tomorrow morning (I was just too cold this morning to want to open the windows up). then I'll be able to do the tufting and flocking to finish them. I've started assembling the two 4Ground dark ages buildings I bought at SELWG this evening. I just need to add the detailing (windows, doors etc) and coat the fake-fur thatch with 50% PVA and they'll be good to go. Well, I had plenty of superior units who got stuck in to my opponent's forces. Unfortunately they were supported by my usual crappy generalship and decidedly inferior dice rolls. Yup, another loss, but I did learn some useful lessons. Oh, and the loss was bigger than normal as Andy broke enough of my units to cause a "rout", although I had broken one or two of his along the way. The game could have been over much quicker if my dice rolls to rally one broken unit had followed the pattern of the rest of them - I managed to rally it up from broken to steady in 3 turns. However, having lost 2 bases (from 4) there wasn't really much that they could do. The only unit that the dice seemed to like (for a while at any rate) was one of my veteran (=superior) foot units which did a marvelous job of smacking a hole through Andy's infantry centre. See what I mean about crappy generalship? Yup, I spread myself out much too thinly. Yay! The dragoons I painted up for Andy as his prize (plus a few he'd painted up to match them). Bunfight on my left wing - 4 bases of Superior determined horse vs 8 bases of average horse (ie, equal dice at impact and in melee). Even though I've gone disrupted it should be a sure win for me here, shouldn't it? ...errrrmmm, that should have been a sure win for me, shouldn't it? Meanwhile in my centre, one unit of veteran foot are trashing Andy's mere average foot. Unfortunately their neighbours aren't particularly liking being shot at having lost 2 bases and dropped to fragged. My other lot of determined horse on the right wing have now auto-broken from base losses. Well, that's what comes from fighting an equal opponent with your hands tied behind your back by crappy dice. The "red" determined horse are getting very close to the baseline - can they be recovered in time? They could - this must be two turns later as they now have a green "disrupted" marker. In my centre, you can probably see one of my superior veteran foot units running down the hill away from the enemy. Quick question - if it is your own army (possibly including younger versions of yourself) from 3 years before, can they be called the enemy? And the other unit of superior veteran foot breaks, the last one Andy needed to rout me. 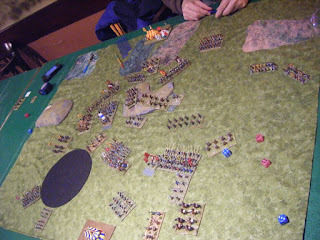 Hopefully my NMA will do better tomorrow night against Gordon - their first game of our club's ECW tournament. I spent last night and the start of this evening prepping the 24 "Croats". They're soaking in soapy water now and will be put out to dry in the morning. Tomorrow evening I'll stick the horses onto painting sticks then glue the riders onto the horses. After I'd finished the prep I dry-brushed the metalwork of the cuirassiers, pikes, musketeers and artillery I had done basecoats on the other day. I know - things have been a bit quiet on the painting and blogging front for the past couple of weeks. Hopefully I'll be picking up the pace again now. This weekend I've finished painting the camp and ambush marker bits, done the Klear/ink coat and stuck them onto their bases. This morning I dry-brushed the basing gunk. However, the weather here is crap so I haven't been able to do the matt spray which means tufting and flocking will have to wait. This afternoon I've been doing basecoats on the various figures I've got prepped. Currently in the painting queue are 24 cuirassiers, 12 pikemen and 18 musketeers plus two guns and crews. I've got a 650pt game of FoG:R tomorrow night as a practice for the club's ECW tournament; my first tournament game is on Thursday. I'll need to work out my army list this evening and get my figures packed. I've decided to take a different approach to my blogging going forward. Rather than daily WIP posts, I'll normally only post pics of units when they are finished (well, painted and stuck on bases with gunk at least - given the crap winter weather it may be a long wait for them to be fully finished). I'll probably be doing a weekly "on the workbench" post so that you have an idea of what I'm up to. I've also decided to drop pic sizes down to 640 x 480. There is a good reason for this - it's one of the camera settings so I won't need to faff around in Paint re-sizing them, which means I can upload them so much quicker. When I got home from work this evening, issue 301 of Wargames Illustrated was waiting for me. The first thing I noticed was that the back cover was a Saga Battleboard for the Byzantines. Inside are the 4-page faction rules. A brief read-through of the abilities shows that the Byzantine units need to work very closely together. I'm guessing that these will be available as PDFs for downloads on the WI website in due course. One thing that strikes me as being a little odd is that an empire which hired lots of mercenaries cannot include "Swords for hire" in their warbands. I haven't really been in the mood for painting the past few evenings, but I have got a little bit done this evening on the camp pieces. I know I said I'd be posting my pics from SELWG this evening but I was knackered when I got home and didn't feel like doing all the work to resize and organise them. Hopefully I'll be able to do that tomorrow night instead. I headed down to Crystal Palace this morning for SELWG 2012. The journey was frustratingly long in both directions as the Victoria Line was closed all weekend for engineering works, meaning I had to take 2 buses and a train each way, which gave a total travelling time of 5 hours there and back. I did take quite a lot of photos - I need to resize them which will take a while, so I'll probably post them tomorrow night. My main impression was that the show was noticeably less busy than last year - fewer traders, fewer games and fewer punters. I'm guessing that could be down to the seeming lack of publicity for this year's show. However, I will say that the overall quality of the game tables was much higher than last year. There was some truly outstanding terrain on show. I did manage to buy most of the things I was intending to, plus a couple of things that I spotted and remembered that I will need for a couple of projects. I also managed to meet up with the Rejects (Ray, Fran, Postie and Big Lee) for some banter, plus Clint (Anything But A One blog) who had traveled up with them. Following my last post Fran gave me a specially anointed Rejects die - with instructions not to ask how it had been anointed or what with, and a further instruction not to lick it. Errmmmm, I put it in my pocket. So, what did I purchase? As I said earlier, pics will be posted tomorrow. Yup, that's the final score of the Spanish leg of my Swiss army's tour of Spain. After losing to the Crown of Aragon army last week, they managed to lose pretty badly to the Santa Hermandad Nueva Castilians this week. The battle was pretty close until the last few turns when my dice decided to completely betray me. We'd both had a couple of units broken (and had later managed to rally one each back to disrupted). But as I said, my dice turned against me, forcing one pike block (of 12 bases) on my right flank to charge some skirmishers, rolling very long for the charge distance which meant that Gordon was able to gang up on it with an 8-base pike unit charging it frontally and two other heavy foot units which charged in on the two flanks. My initial deployment and plan were pretty good. The trouble was that I didn't stick to the plan, so my deployment was no longer right. Anyway, here are pics with some explanations. The terrain before any troops are deployed. Along Gordon's rear edge are 4 areas of brush, with two steep hills in front of them. The black circle marks an area of impassable terrain - it was in a good position for me to use as an anchor for my pikes - if Gordon hadn't been able to move it in from the side edge it would have been even better for me. This 8 of pikes failed their CMT not to charge the light foot (at that point in the game a rare event), but rolled very long for their charge move whilst the skirmishers rolled short and got caught in the rear. Light foot vs Swiss pikemen? Somehow the left hand light foot survived the impact, but did go fragmented.. Unlike their comrades who managed to double-drop and break. The skirmishers on the right of the pic were in range to have to test for seeing the break and promptly dropped 1 level. Gordon's light horse close to completing their flanking movements. Javelin armed Jinetes on my left flank, mounted crossbowmen on my right. Well, that didn't quite go to plan. 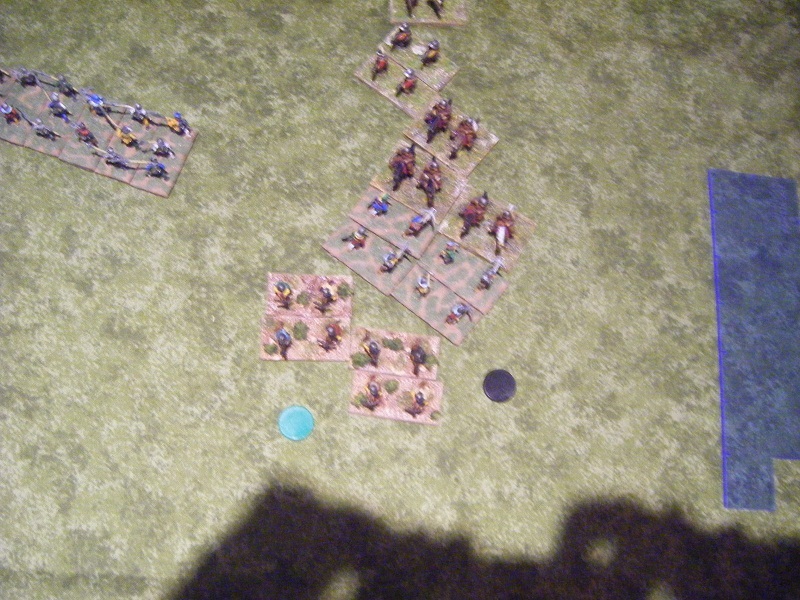 The pikes failed their test not to charge and ploughed headlong into one of the heavy foot units in front of it. the other heavy foot unit was then in a position to flank charge them. Ouch - I managed to double-drop in the impact phase and break. With one of my light foot units right behind them. Oh, and a corner of the 12-base pike unit coming up to support them. Did I mention that Gordon managed to kill the general who was fighting in their front rank? No? Well, he did. 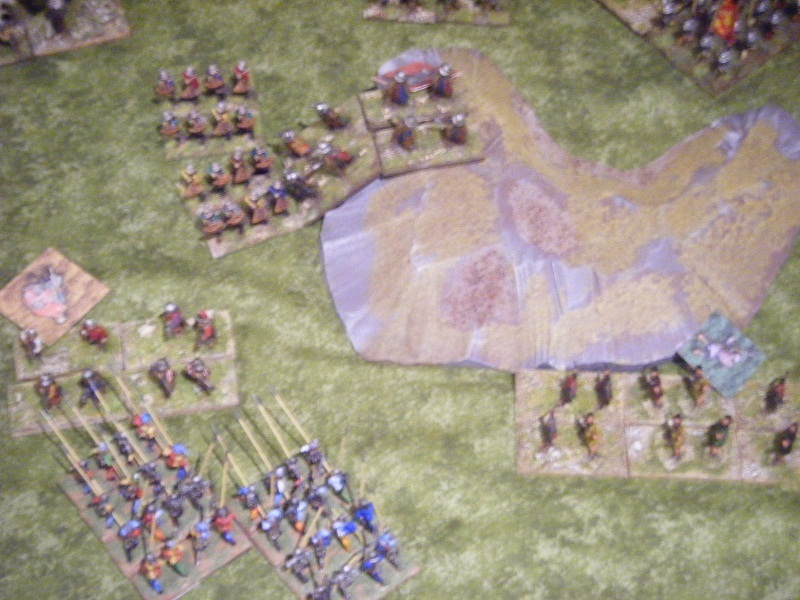 The rout move took both the skirmishers and pikes to disrupted, the skirmishers were caught in the rear by the pursuing heavy foot and also broke. However, the heavy foot's pursuit of my skirmishers caused them to crash into the 12 base pikes. They lost that impact, then the melee and broke. 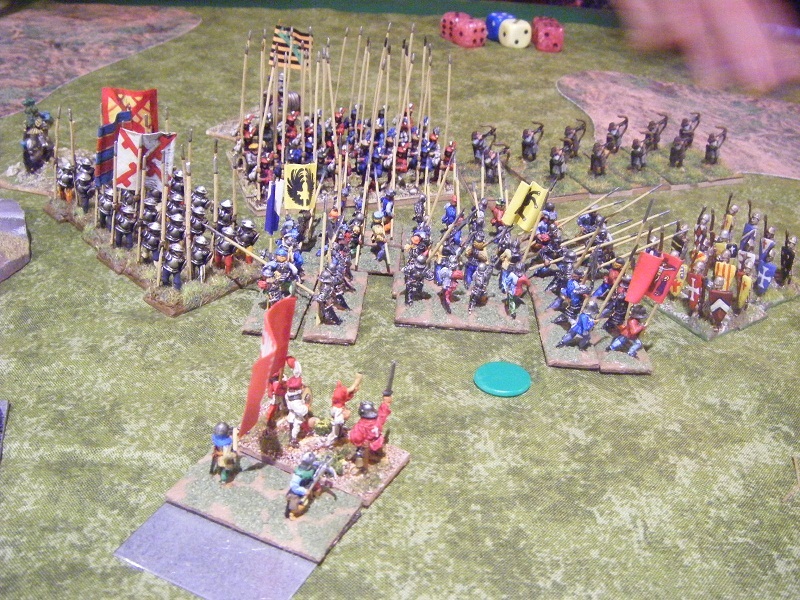 My pursuit took the pikes into the other heavy foot unit. Bring it on! The last turn. 3 turns back, my right flank pikes had failed their test not to charge Gordon's bowmen and then rolled very long for their charge move, leaving them in a very nasty position - Gordon was able to bring forward his pikes ready for a frontal charge and two groups of heavy foot into flank charge positions. 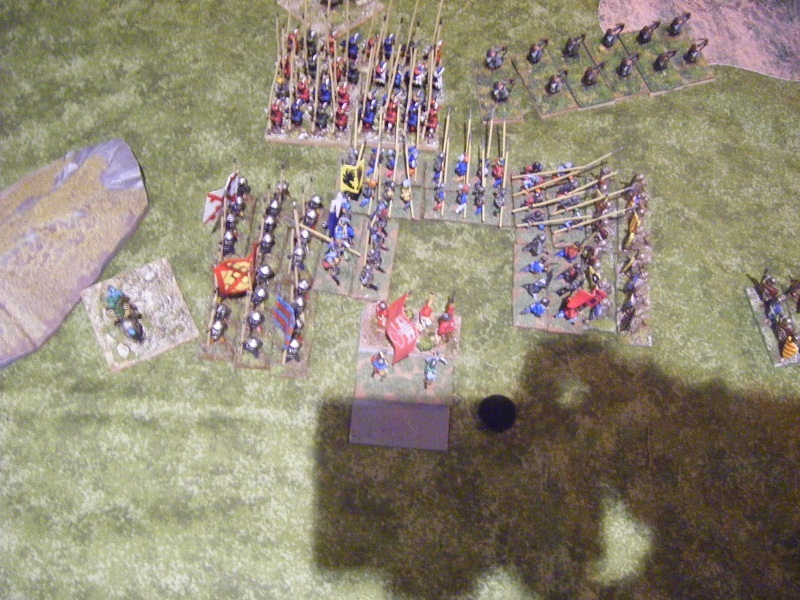 The charges went in at this point, along with a flank charge by his medium foot crossbowmen on my other 12-base pikes over on the left and his mounted crossbowmen against my light foot over on my right flank. The light foot didn't roll high enough for their evade moves and one got caught in the rear. Disrupted from the 2 flank charges, facing in 3 directions, heavily outnumbered, no rear support. Gulp! Broken in melee phase, their comrades don't like that and disrupt (I definitely mentioned the sucky dice I suffered in the last couple of turns). The broken unit then routed through the disrupted unit, dropping it to fragmented. The mounted crossbowmen then pursued into their rear dropping them instantly to broken. Having survived the impact (although dropped to fragmented) these pikes didn't survive the melee phase and broke. 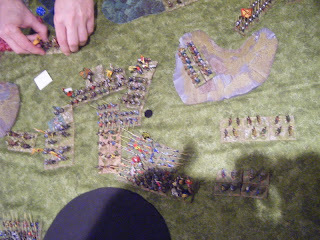 Meanwhile, on my left flank things didn't look quite so disastrous. My pikes may have been disrupted by the flank charging medium foot, but they've got another pike block coming up rapidly in support. Well, as rapidly as pikemen can move up in support that is. 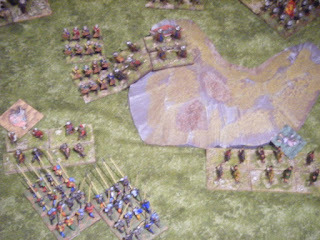 Would things have gone better if I had been using my won Swiss rather than a borrowed army? Who knows. Probably not. I will get round to completing my Swiss at some point. I haven't done any more painting or prep work, but have primed the figures I prepped earlier in the week. Tomorrow I'll be heading saarrff ofva rivver (usually followed by "You've gotta be joking!") to Crystal Palace for SELWG. I'll probably be picking up some bits from Timescape and Magister Millitum. Oh, and that Evil Man Jon Tuffley has released some new figures - heavy weapons and jet-bikes for the UNSC, a Kettenkrad-like half-track for the NAC, spider drones with rotary autocannons and the first full packs of figures for the official Tomorrow's War range. There are pics of them over on Dropship Horizon.